When former Penn State head football coach Joe Paterno decided to eschew law school in favor of coaching football, his disappointed father Angelo told him to “make an impact.” He listened. Joe certainly made an impact on everything with which he was involved. It is tragic that his tenure had to come to an end the way it did, and we pray that some of the damage to Joe’s legacy exacted by the hasty rush to judgment by the Board of Trustees can be repaired. In the meanwhile, the vigils and tributes have been amazing, albeit somewhat expected. In this edition of “Quick Hits”, which will hereinafter called “Sudden Impact” (thanks to Artificially Sweetened, who actually devoted a significant chunk of her valuable time to ruminations about potential titles), we provide links to several tributes and campus reports. The official PSU athletic department site has a collection of thoughts penned about Joe in the brief time since his passing this morning, including President George H. W. Bush, Archie Manning, and several Big Ten and Non-Big Ten coaches. There will be more, so this installment is called “Reflections on Joe Paterno, Part I“. Ivan Maisel reports on the tributes on campus in the Big Ten Blog. Bob Flounders recounts the differing reactions of Joe Paterno’s friends and co-workers to his passing in the PennLive.com sports blog. Penn State Live has a story and many pictures of tonight’s candlelight vigil. Mark Brennan of Fight on State reports that the lights will be left on at Beaver Stadium until Joe’s memorial service sometime later this week. Shelly Stallsmith of the Patriot-News advises the haters to go away. And finally, from JoePa’s Doghouse, a cute little vignette of life from the perspective of a child. At least for this Turkey, the full impact of this one life without Joe Paterno has yet to be felt. There will be no more Tuesday media gatherings with the inevitable admonition that “You guys don’t know what you’re talking about!” and the cautionary note that, for example, “Coastal Carolina is a well coached, good football team.” No more pacing on the sidelines, chewing out McQueary, chasing after game officials. Even though I’ve had since November 9 to gird myself for these voids, I still feel it’s surreal. Beyond the loss of the quirky head football coach, we all lost a friend, mentor, and virtual family member. Just about anyone who attended Penn State over the past 50 years has a Paterno story or two to tell. Why not? We all grew up with Joe’s constant presence in our lives. For those of us lucky enough to have been in that position, the loss will be felt more deeply, but the memories will last throughout our lifetime. 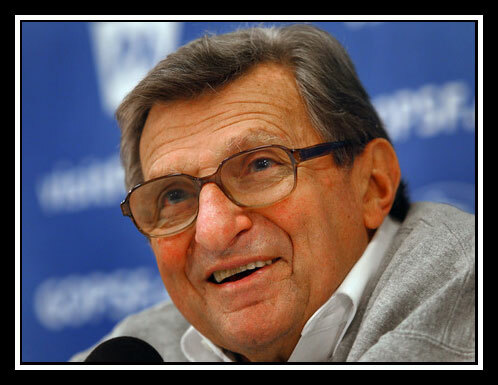 Joe Paterno died of metastatic small cell carcinoma of the lung this morning at 9:25 AM surrounded by his family. He was 85. Words fail me at the moment. There is just so much to say that it is beyond the capabilities of this meager blog. All I wish to add to the official statement is that I hope this legendary coach will be properly honored — that bygones can be bygones and that there will be no asterisks next to his achievements. I would hope that the Maxwell Club would think again about restoring his name to their coaching trophy, that he will receive the Presidential Medal of Freedom posthumously, and that other knee-jerk reactions of that sort can be reversed. There will never be another like Joe. The Nittany Turkey wishes the Paterno family comfort at this time of loss.